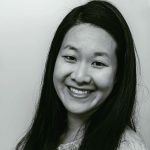 Published Sep 27, 2018 By Julia Leave a CommentThis post may contain affiliate links. 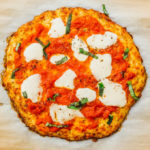 A keto and low carb alternative to your usual pizza: a cauliflower crust with margherita toppings like tomato sauce, fresh mozzarella cheese, and sliced basil leaves. My usual go-to low carb pizza is made with a standard “fathead” dough, composed of almond flour, mozzarella cheese, cream cheese, and egg. 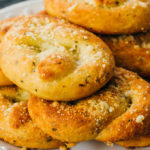 That crust is probably the most similar to wheat-based crusts that I’ve tried. 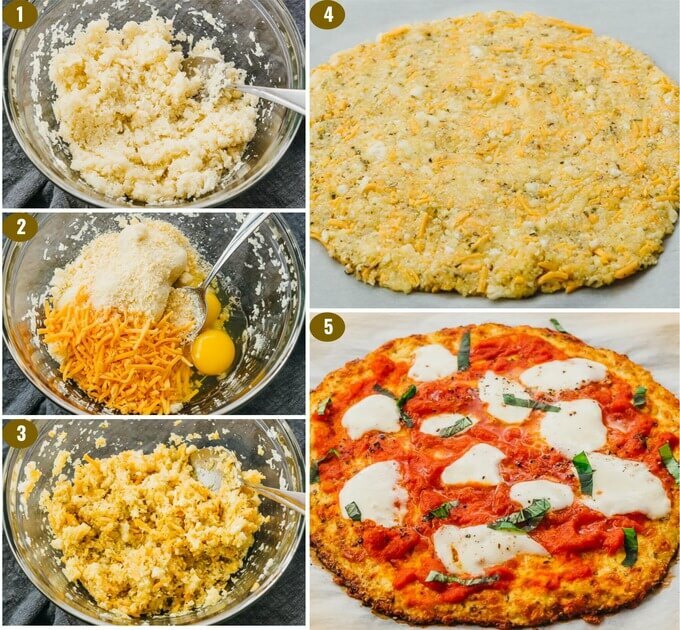 This post is all about pizza with crusts made from grated cauliflower, cheese, and eggs. 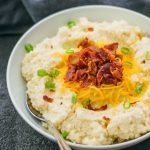 It’s great for anyone who prefers the taste of cauliflower over almond flour or has a nut allergy. 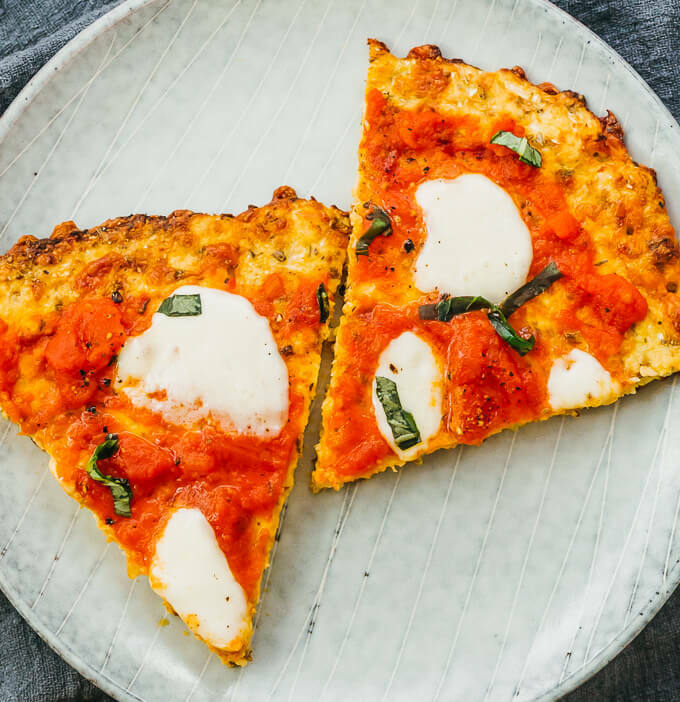 The cauliflower crust is crisp and firm, but isn’t as crunchy or sturdy as the almond flour “fathead” version, so it’s best to pair it with simpler or lighter toppings. 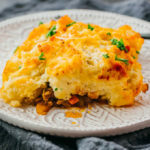 Read on for more photos, cooking tips, and the printable recipe! Baking sheet. Use a flat baking pan large enough to hold a 9-10 inch pizza. Parchment paper or baking mat. Use any kind of oven-safe nonstick surface to line the baking sheet, so it’s easy to slide the pizza from the pan when it’s done. Don’t use wax paper, as it’s not safe for use in the oven. Plastic wrap. Cling wrap is really handy for covering the raw cauliflower crust so you can flatten it into a large circle without touching it. Cheesecloth or nut milk bag. Raw cauliflower has a lot of moisture that should be removed for a crisper crust. I use a nut milk bag to wring moisture from the cauliflower after it’s been grated. Cheesecloth or a tea towel would also work. You can start with a head of cauliflower or use pre-packaged bags of cauliflower florets — I usually opt for the latter to save time. If you use a head of cauliflower, cut it into individual florets first. Then use a box grater or food processor to grate the florets. I don’t recommend using bags of pre-riced cauliflower because different brands vary a lot in the thickness of the individual cauliflower “rice” pieces, and they’re usually much larger compared to home grated cauliflower. 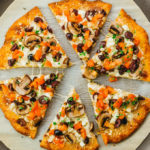 You want to use smaller pieces for this recipe because they’ll combine better with other ingredients to form a smooth pizza crust. Also, freshly grated cauliflower will more readily absorb salt and release liquid (see step 3 of the recipe) compared to pre-riced varieties. 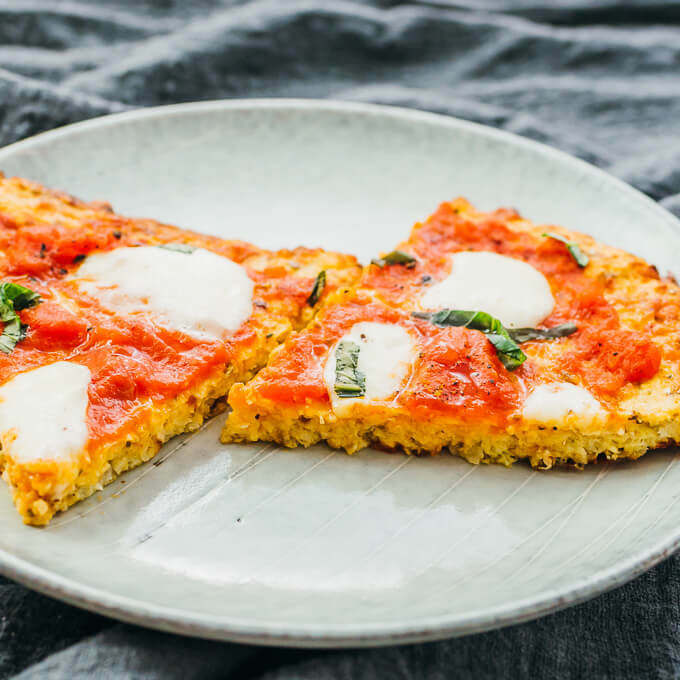 The key to a crisp cauliflower crust is squeezing as much moisture as possible from the freshly grated cauliflower. The less liquid it contains, the faster it will crisp in the oven. The recipe below gives an estimate for how much liquid you should be squeezing out. That’s why I salt the cauliflower mixture after grating it, which aids in releasing liquid. 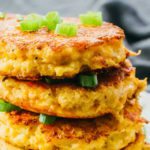 It’s something I do whenever I want a crisp cauliflower finish, like for these cauliflower fritters that remind me of hash browns. Another way to get a crisper crust is to bake for a longer period of time than the estimate mentioned in the recipe below. This will also depend on your particular oven and your taste preference. Position an oven rack in the center of the oven. Preheat to 425 F. Prepare a large baking sheet lined with parchment paper or a baking mat. Using a food processor or box grater, grate the cauliflower florets. In a bowl, stir with salt until well-mixed. Using a nut milk bag or cheese cloth, squeeze moisture from the grated cauliflower, discarding about 1/2 cup of liquid. In a large mixing bowl, combine grated cauliflower, cheddar cheese, parmesan cheese, eggs, and oregano. Stir until well-mixed. Transfer the mixture onto the lined baking sheet. Cover with overlapping sheets of plastic cling wrap. Spread and flatten into a 9-10 inch diameter circle. Discard the plastic wrap. Bake at 425 F until the top is golden, about 20 minutes. After baking, remove the pizza from the oven and add desired toppings. For margherita style toppings, use a spoon to spread the tomato sauce evenly across the surface. Distribute mozzarella cheese on top of the sauce. Drizzle with olive oil and season with black pepper. 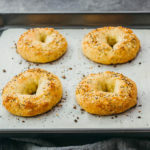 Return to the oven and bake for another 5 minutes or until the crust looks crispy and the toppings are heated through. Top with basil. Cut into slices and serve. 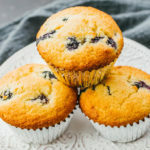 This recipe yields 2 g net carbs per serving (1 slice or 1/6 of the recipe).